★ Keep Good Memories ★--Record the first and last day of school. Professional premium bright colors, perfect photo board prop for boys or girls. Keep good memories, leave precious pictures and share with family or dear friends. ★ Colorful Designed ★--Red, blue, green, yellow, colorful designed title and signs, decorate your life. 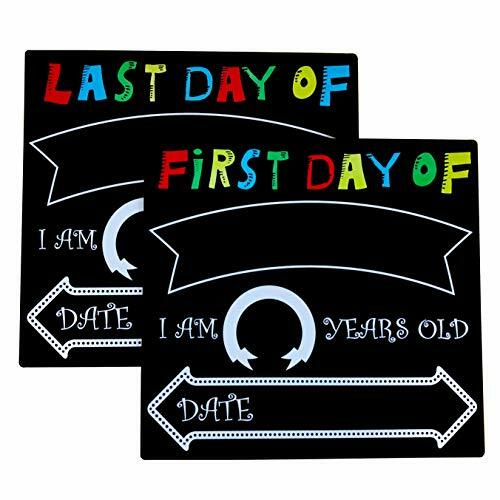 Elegant digital printed \'First or Last Day of\', \'I AM YEARS OLD\' and \'DATE\' signs help u use chalkboard easily, write down grade, age and exact date, spend less than 30s. ★ Green Reusable ★--Authentic reusable chalkboard, use normal dustless chalks write repeatedly and wipe by water or wet cloths. Not use liquid chalk markers or pens, better buy chalks in local market or stationery store, chalks are easily broken during transport, that\'s why chalk not included. ★ Back Whiteboard ★--Buy one set get chalkboard signs and whiteboard. The back of the chalkboard signs is whiteboard, use whiteboard marker write down words you want or draw beautiful picture. ★ 100% Satisfied! ★--Not cheap print paper, True wood made! Chalkboard 11.8 X 11 inches in a 2 mm wood, great for children\'s hands! 100% satisfied and 12 month friendly customer service. SSZY provides customers with a lifelong warranty since you choose SSZY.